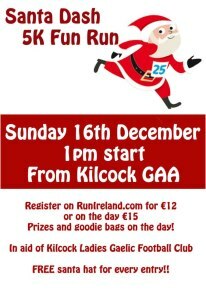 Someone once told me that if you want an event organised to the highest standard around the town of Kilcock, ask the members of Kilcock Ladies Gaelic Football Club for help and on Sunday last, 16th of December, I seen why. The girls hosted, with great success, their inaugural ‘Santa Dash 5k Fun Run’, with over two hundred people turning up to take part. The race was held in aid of Kilcock Ladies GAA to help fund raise for the continuing upkeep of all teams which includes fees to enter leagues, to pay referees and registration amongst many other outgoings on a weekly basis. Thankfully for the ladies they were blessed with the weather and they got the athletes off on the scheduled time of 1pm and despite his busy schedule, Santa Clause himself even made an appearance and was kind enough to officially start the race and lead the competitors around the 5km route. The route, known as the ‘Sli Na Slainte’ or Laragh to others is a popular walking spot for the locals of Kilcock and one which saw athletes of all standards take off from Connaught St. parralell with the railway and canal, head out around Laragh and back into Kilcock via the picturesque Cortown Woods and eventually reach the finish line at the entrance to the GAA at Branganstown. The Athletes round the first corner. First of the two hundred strong field to get home was Mullingar man and pre-race favourite Vinny Connolly who crossed the line in an impressive 16mins and 22secs. With Connolly having just completed his race, the first of the Mooney Brothers from Clonard, Peter, came into view and finished strongly to take second place on a time of 16′.31′. Mooney was just ahead of Sean Taltey in third and his brother in fourth. The next two men home brought about the first big cheer of the day as Kevin Kelly and Andy Smyth (both St.Cocas Kilcock) battled for fifth place all the way to the line, with Kelly just getting his nose in front and in doing so claiming the title of ‘First Kilcock Man Home’ on a time of 17′.37′. 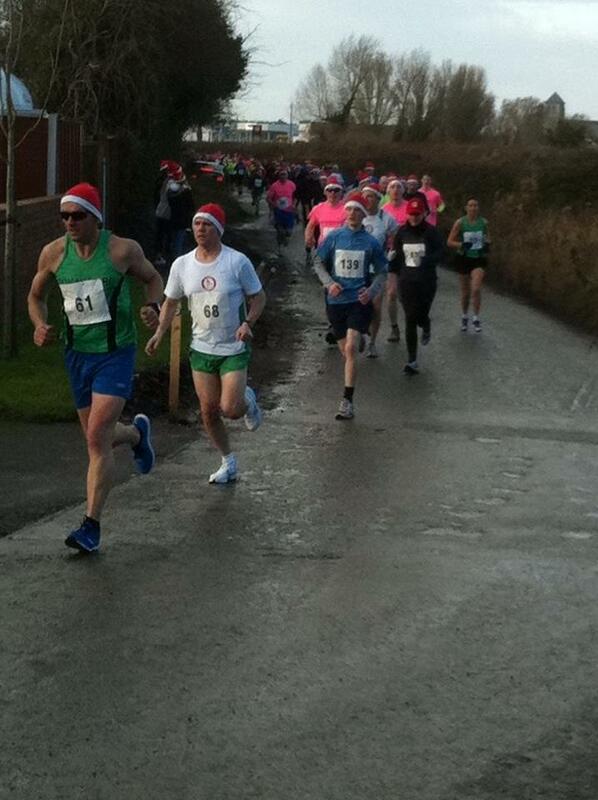 In the Ladies Category, Charolette Kearney of Donadea Running Club took the honors by well over a minute on 18mins. 31secs. Charolette had an added incentive to push herself home as she was chased closely by her husband Ollie but she won the day and in doing so gained some well deserved bragging rights which I am sure she will use over the Christmas period!! Maura Kearns (19′.46) and Eilenn Rafter (20′.34′) took second and third respectively but have some time to make up on the remarkable Kearney. St.Cocas’ Eoin Reidy (19′.43′) was the first of the u-16’s home. Meanwhile on a less competitive note, Kilcock Ladies manager Shane Stone (20′.47′) did his team proud coming home in 20th place. Stone received plenty of cheers aswel as some ribbing from the girls who took joy in seeing him put in the hard yards for a change as he ran up the hill to the finish. All that started the race, completed it, with many of them dressed for the occasion in their Santa outfits and it was great to see mothers, fathers, kids and even some dogs come home with a smile on their face. 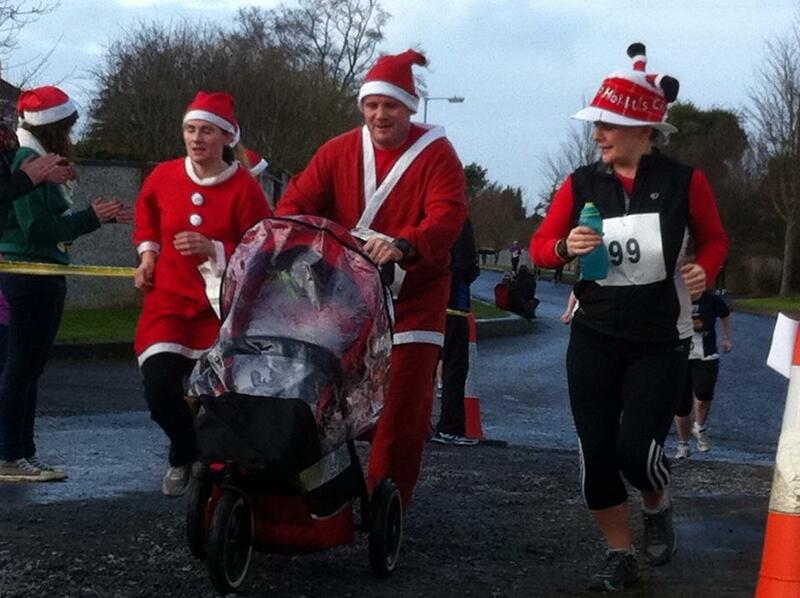 Santa and his helpers reach the finish line. Everyone that registered for and took part in the race received a Santa hat and a goodie bag to help them get in the Christmas spirit. A cake sale was also held on the day to raise money for The Hospice in memory of the late Ciara O’Brien who recently lost her brave battle with cancer. Ciara played for the ladies a few years back and her family are key members of Kilcock GAA. RIP. 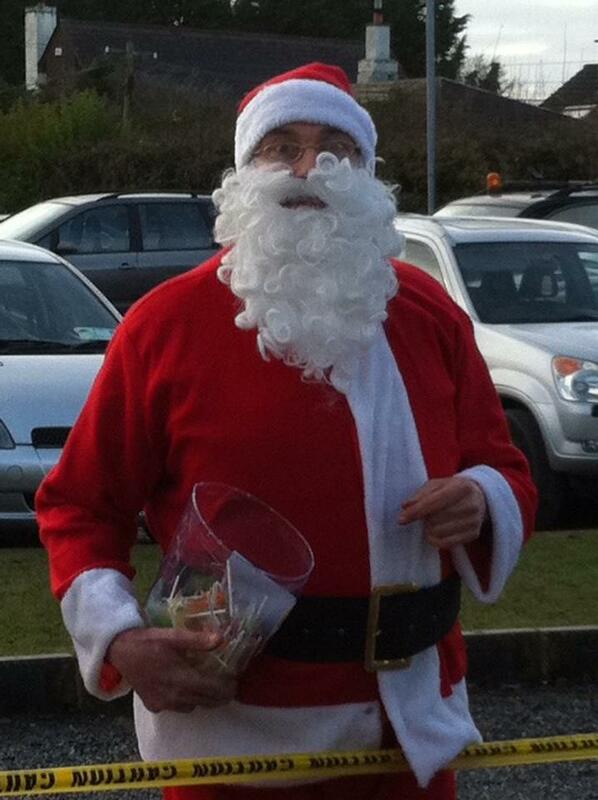 Santa hands out lollies after the race. One thing is for sure if the girls of Kilcock GAA have anything to do with it, we will definitely be seeing everyone back at the starting line this time next year! !